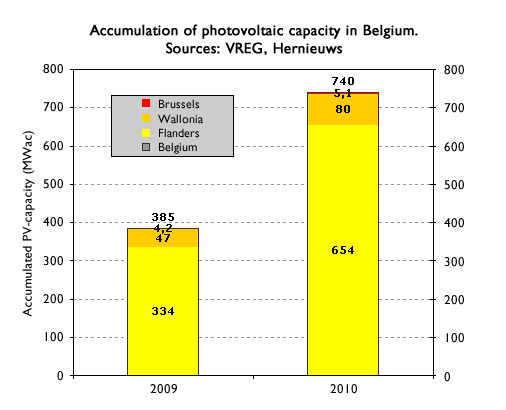 Accumulated photovoltaic capacity in Belgium could be 740 MW* end of 2010, with an 88% share for Flanders. Growth rate has deteriorated, but the market for smaller installations remains promising. 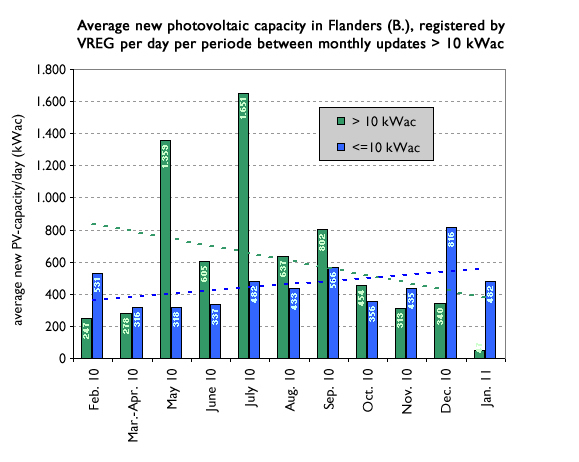 Growth in Belgium’s largest market, Flanders, regulated by VREG, has cooled down in 2010. There was a big rush at the end of 2009 (11.000 installation requests in December), but it is not yet clear to which “realization” year these installations will be allocated. According to official VREG publications, there are some striking differences in the data published by branch organization BelPV, as shown in Fig. 1. With 245,1 MW growth** (2009) and the accumulation of 334,3 (2009) and 654,4 MW (2010), preliminary VREG-registered growth in 2010 would be 320,1 MW. However, BelPV claims 412,7 MW accumulation in 2009 and 165,0 MW in 2010. 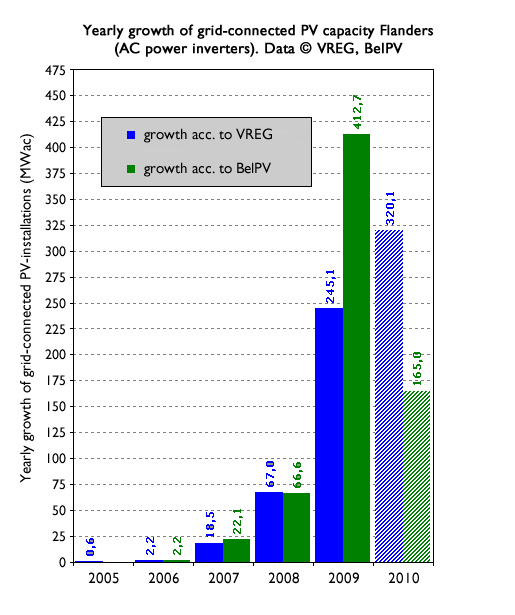 These huge differences most probably result from diverging interpretations of what should be considered a “grid-connected PV system.” Adding together the 2009-2010 growth numbers, the difference is only 2,2%: VREG 565,2 MW, BelPV 577,7 MW. BelPV estimated that for additional PV-capacity in 2009, households in Flanders would have paid 0,13 Eurocents/kWh extra on their average electricity price (€ 0,17/kWh). Registration of the larger installations such as the 40 MW Katoen Natie project can take a long time. However, 64% of applications in this category would be handled within 2 months by VREG. Smaller systems of up to 10 kW apparently are registered on a more regular basis, see Fig. 3. In Flanders, large-scale power plants >1 MW accounted for 77 MW of accumulated capacity (fig.2) - almost 29% of the volume of the >10 kW category, and 9% of the total capacity. Fig. 3 shows newly VREG-registered capacities on an average daily basis per period, with trend lines. >10 kW installations (green columns) are unevenly distributed, with high capacities in May and July 2010. Growth collapsed in January 2011, and it is expected that with new tariff cuts for solar electricity this market segment might face further troubles. However, new registrations for the small category (blue columns) remain at a healthy, relatively constant level (roughly 300-600 kW/day), apart from the small “end-of-year 2010 rush” (816 kW/day). In December 2010, just prior to a 2 Eurocent/kWh cut in feed-in tariffs, 6.000 new requests would have been filed with VREG. This used to be 2.500 per month earlier in the year. 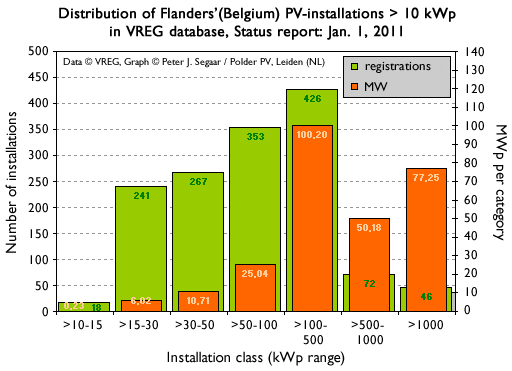 In Flanders, approximately 60% of the accumulated capacity of 670 MW reached end of Jan. 2011 falls within the <=10 kW category. Approximately 106 W/inhabitant has been realized (in nominal DC power that could be 118 Wp/inhabitant, as compared to 192 Wp/inhabitant in Germany at the end of November). 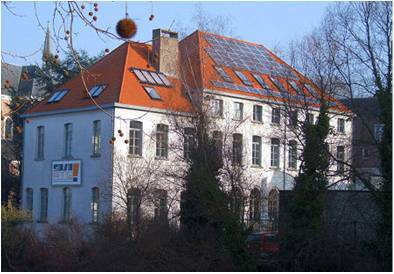 Flanders is now confronted with a legislation proposal, which was very slightly changed following a storm of protest by the solar industry in November 2010, that will further bring down the value of green certificates for PV from today’s € 0,33/kWh in 3-month steps each of 2-4 Eurocent/kWh. >1 MW installations with less than 50% self-consumption will be hit hardest, reaching € 0,09/kWh in 2012. BelPV claims, however, that 200 MW of new PV capacity could be added in 2011. Wallonia has performed less well than previously, and on a much smaller scale. CWaPE reported 37,3 MW capacity in new installations in 2009**, and the Brussels magazine Hernieuws estimated 80 MW end-of-year capacity for 2010, which gives a growth of 33 MW for that year. In view of the abolishment of regional incentives apart from a complicated green certificate regime, it is a fair but relatively minor market. 95% of installations are residential, 2010 resulting in an accumulation of 24 W/inhabitant. Regulator Brugel reported in June 2010 that the capital, Brussels, had added 3,4 MW of capacity in 2009** (accumulation: 4,1 MW). Hernieuws suggested accumulations of 4,2 MW (2009) and 5,1 MW for 2010. Hence, a meagre growth of only 0,9 MW in 2010, possibly due to the abolishment of a regional incentive without compensation in the green certificate legislation (as in the case of Wallonia). Mostly small installations have been realized, with a few 50-100 kW projects reported (2009-2010). Only 5,1 W/inhabitant would have accumulated at the end of 2010. As shown in Fig. 4, the end of 2010 saw an accumulated volume of approximately 740 MW in Belgium, enabling the country to establish its 5th position in the EU ranks, before France. 88% of capacity is in Flanders. While Hernieuws and VREG data totalled up to 385 MW for Belgium in 2009, EurObserv’ER recently counted 363 MWp DC capacity. Based on the original AC data, 2010 could have seen growth of 354 MW. With a population of 10,8 million, the country as a whole would have reached a level of 68 W of installed solar capacity per inhabitant (75 Wp DC). The status of the Belgian market and the expected developments of the near future will be discussed during The Solar Future: Belgium. This high-level conference focuses on the business opportunities for photovoltaic solar energy (PV) in Belgium. Belgian and international experts discuss the current and expected rules and regulations, the international developments and cost trends in the fast growing PV industry, the practical experiences, the expectations and chances for further development of the Belgian market. **Data EurObserv’ER Report Renewables in Europe 2009 (DC capacity): Growth in 2009 251 MWp Flanders, 38 MWp Wallonia, and 3,1 MWp in Brussels. For more information about SolarPlaza, visit www.solarplaza.com. For more information about the upcoming conference, “The Solar Future: Belgium,” visit www.thesolarfuture.com. Solarplaza is the independent global platform for knowledge, trade missions and events related to solar energy. Solarplaza is located in Rotterdam and has already organized over twenty-five international conferences and trade missions in Greece, California, France, Taiwan, China, India, Italy, Germany and Spain, to name but a few.